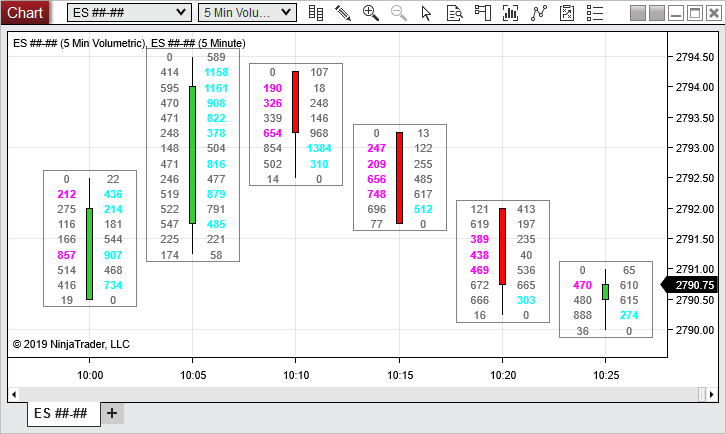 NinjaTrader Order Flow Volumetric bars provide a detailed ‘x-ray’ view into each price bar’s aggressive buying and selling activity. This technique primarily attempts to answer the question which side was the most aggressive at each price level. This is done by calculating the delta (greek for difference) between buying and selling volume (please see the Delta type property explanation below). With the delta value known for each price level in the bar, it is then classified per each session for analysis and emphasizes the buying / selling strength unfolding. This is done by a gradient coloring approach shading the value cells in the bar, where the level of sensitivity for the gradient can be set via the Shading sensitivity property. The higher this value is set, the finer the gradient can be applied to various levels of strength - the NinjaTrader default is 20 levels. This can be thought of as a way of not only saying who ‘won / lost’ the price level’s auction, but also by what margin or strength. This is not a signal in itself per se, but rather a mechanical means to classify the buying vs selling activity at each individual price level and thus offer the trader a more detailed look what happens inside the price bars. A second comparison of buy sell volumes is the Imbalance detection. Here the price level buying and selling volumes are compared diagonally to understand which side of the market was stronger by exceeding the set Imbalance ratio. For example if the buying volume was 1000 contracts and the selling volume diagonal below was 300 then buying Imbalance was detected (assuming a default Imbalance ratio of 1.5). This can be helpful especially if multiple Imbalances 'cluster' close together to form support / resistance areas. 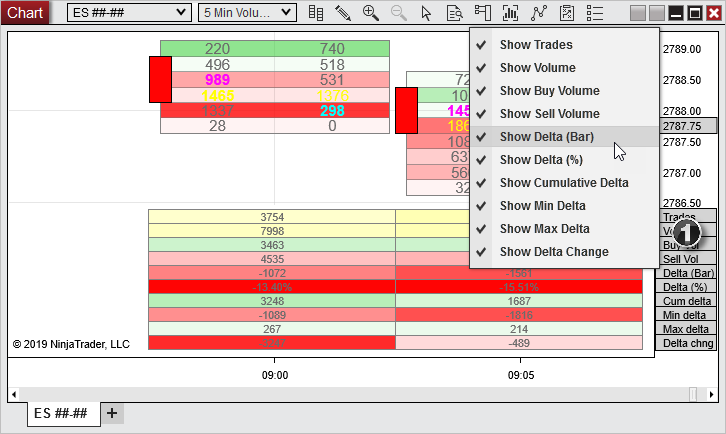 NinjaTrader Order Flow Volumetric bars can provide a large degree of details and facilitate displaying the information in a dynamically sized way, as the text is re-sized as your horizontally or vertically adjust the chart's scale range. Critical: To perform the delta buy / sell aggressor classification (DeltaType BidAsk), historical bid / ask tick data access by your provider is needed. To see which data providers can offer which type of data in NinjaTrader, please review this table. If your provider could only support 'last' historical tick data, then the classification could still be made using DeltaType UpDownTick mode. 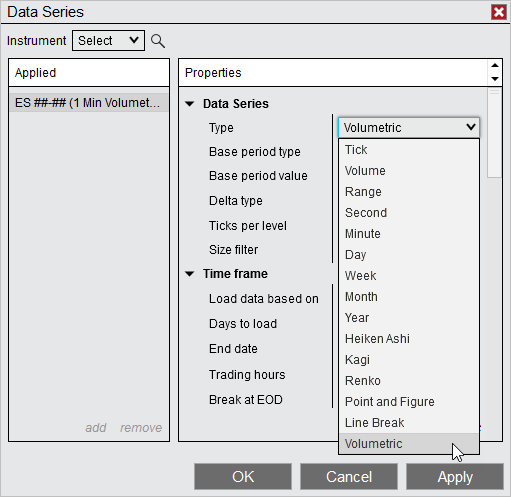 You can apply the Order Flow Volumetric bars within a Chart Data Series window under Type. 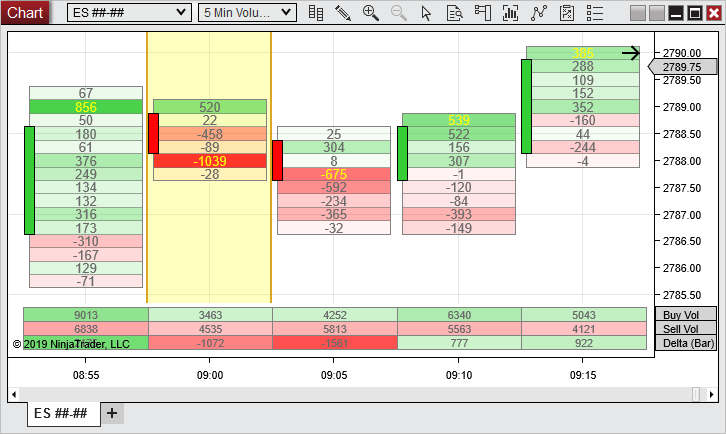 Below we show a 5 minute Order Flow Volumetric BidAsk style chart of the popular E-Mini S&P 500 contract. An exemplary bar in yellow is annotated to show the different components you will work with on an Order Flow Volumetric chart. On the next image, we see an excerpt of the same chart, however now the chart style type is changed to Delta. The bar highlighted yellow corresponds to the annotated bar above - this style, instead of the individual buy / sell volumes, show the combined delta value for each price level. If positive the level was seeing buying strength, negative if selling strength. We see a bid or selling volume of 220 and a ask or buying volume of 740. Taking the difference (Buy volume - Sell volume) so 740 - 220 we get the delta value of 520 - which we see as first cell value in the 2nd screen-shot showing the Delta type. The shading taking place in the bars will always be based on this delta value calculated, the chart style just defines what kind of textual data detail will be displayed (the actual Bid Ask Volumes or the Delta value). Moving on to the lower portion Bar Statistics (6), we see the Buy Vol and Sell Vol for the bar and a delta as well exposed - however, please note that these are summed values for the entire bar. If we sum all the buy volumes we would get 3463; summing sell volumes for the bar is 4535. All the price level deltas summed would equal the delta of the entire bar -1072. The screen-shot below explains the workings of the Imbalance detection in more detail. You can see the Buy / Sell volumes are compared diagonally here to arrive at the classification if buy or sell imbalance is present. 3. 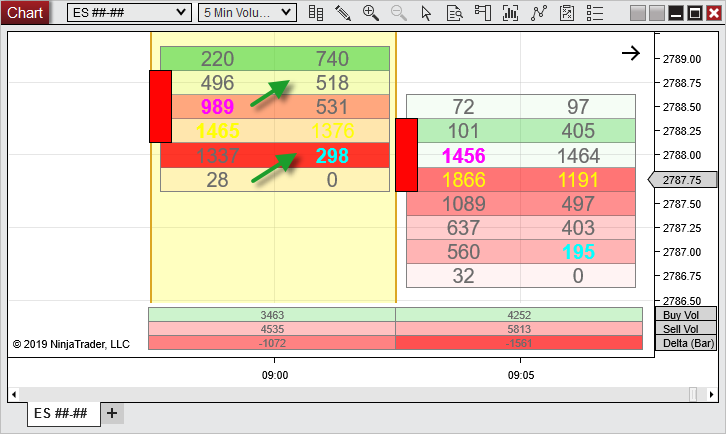 NinjaTrader by default sets the ratio for Imbalance at 1.5, so this level gets marked with Sell Imbalance (magenta text color per default). 4. As a further condition, a minimum difference between the compared values must be present. This value is defaulted to 10 - which is valid in our example as well. In the case that both Imbalance and Maximum would trigger for the same cell, the Maximum would override and be displayed (example shown below at annotation 1). The Volumetric Bar statistics show important values for each Volumetric bar in a static grid-like fashion. The same gradient strength shading as for the main Volumetric bars is applied here. 1.Via a right click in the price scale section the individual statistic values could be enabled / disabled 'on the fly'. Below chart is an example of showing the volumetric bid ask volume bar data as distribution profile, additionally 'hide text' is checked - which means we see the maximum (yellow) as well as imbalance (cyan / magenta) marked via the cell borders coloring. Showing the data in this fashion can give traders an easier read, as differences between light and high volume price areas becomes visually more striking. 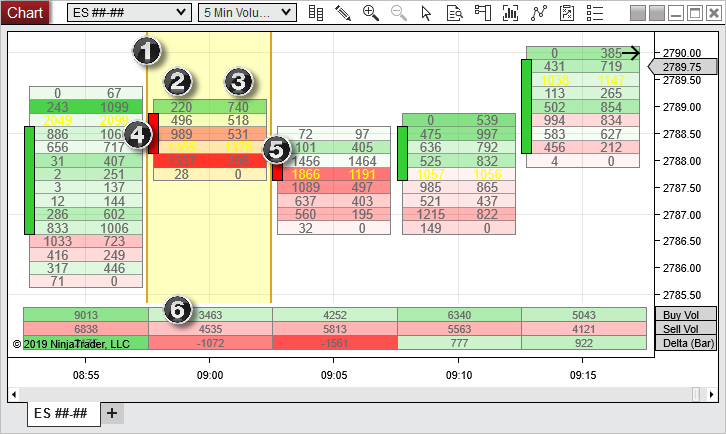 This section presents an example of how NinjaTrader Order Flow Volumetric bars can be highly customized to your trading style. Traders focused on Order Flow Volumetric Imbalances may consider working these charting ideas into their NinjaTrader setup. 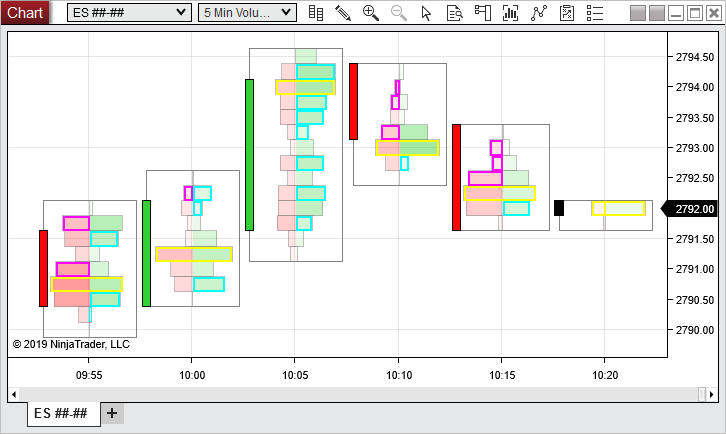 The regular 5 Minute CandleStick chart is brought in to this chart via a second Data Series, so forming a MultiSeries chart with our main 5min Order Flow Volumetric bars. This can advantageous if you prefer to plot the regular bar / candlestick portion in the middle of the bar between the Buy/Sell volume columns. BidAsk - Last trade at the ask or higher is considered buying volume, Last trade at the bid or lower selling volume. Default 0, could be set higher to limit seeing the delta only for trades higher than the size filter setting, for example tracking larger trades only - keep in mind this could be potentially set too high for your chart, so Volumetric bars value cells could show 0 volume, so it never met this criteria then to be considered in the analysis. Check to allow indicators or strategies to access Tick replay data, the main Volumetric bars though will always be built off a 1 tick series. BidAsk - allows you seeing the individual buy / sell volume cells inside the Volumetric bar, buy (ask) volume is shown on the right side, sell (bid) volume shown on the right side. Additionally this style can highlight the maximum and imbalance conditions. 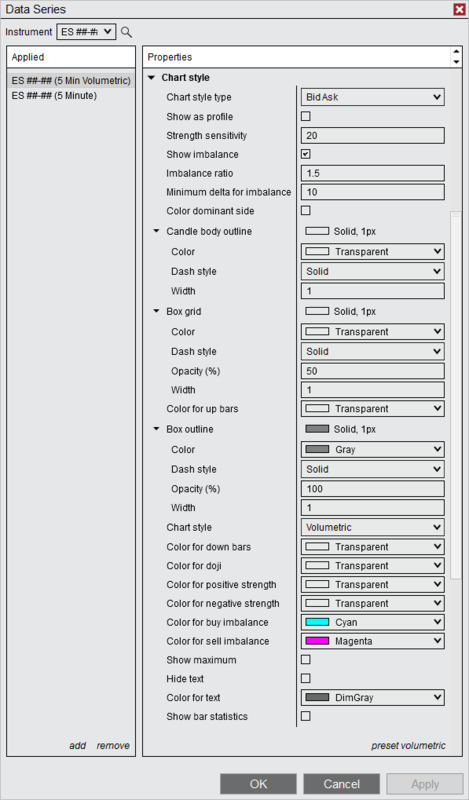 Sets how many gradient levels should be calculated to provide the buy / sell strength shading for the Volumetric bars and Bar Statistics, the default setting is 20. This is reset at every session break to ensure the gradient strength classifications easily comparable across various days market action. Sets the minimum delta to be seen diagonally across compared buy / sell volume columns for displaying Imbalance, default value is 10. Enables the display of the maximum value for the Volumetric bars, if identical values would be seen across cells, then all cells sharing the maximum would be highlighted. The statistics can be toggled as well 'on the fly' from the chart's right scale by clicking on the statistic labels. For information on how to access the Order Flow Volumetric Bars and Bar Statistic values in NinjaScript, please see the Order Flow Volumetric Bars page in the NinjaScript section of the Help Guide.